Belgians are hard workers – Belgen mensen zijn harde werkers. Belgen mensen zijn harde werkers – well, yes. They are indeed hard workers. They prize hard work both on a personal level in a self-satisfaction way and of course an employer prefers a hard worker. My earliest memories are of working. I thought it was fun, but I was being taught to work. My great grandparents looked after me during the day from a very early age as both my parents worked full time. Méme Maria and Péter Jerome had a sizable back yard in my land of birth. In that back yard was a chicken battery, pig sty, storage, rabbit runs and a vegetable field, which was probably more a vegetable patch but because I was so small it felt like a field. Méme Maria and Péter Jerome had immigrated to my land of birth not in their teens or even twenties, but when they were in their fifties. Quite a feat considering there was no Google Maps, no cellphones, barely any telephones and everything was done with mailed letters and postage stamps and an awful lot of trust. Anyway, back to that vegetable field. One of my earliest memories was being taught what green bits to pull out of the ground by Méme Maria and Péter Jerome. It was called weeding. Thinking back, these old folks didn’t stop working until they dropped dead. They were indeed true Belgians with no thought of retirement. Retirement simply wasn’t something one did. The work ethic in Belgium is very different to my land of birth. Here one does his allotted employment with everything he can and all the gusto that can be mustered. Belgians do their work impeccably well with no thought of how the next fellow does his. In this respect I find it a little short sighted but it’s one of those things I need to accept if I’m to be Belgian. Being a hard worker is expected of you and, unlike my land of birth, is seen as something to be proud of. There are numerous after hours courses that may be taken at CVO’s (Centum Volwassenonderwijs – Adult Learning Centres). Vrijwilligers Werk (Volunteer work) is also big here and can be incorporated with hobbies or leisure activities. There’s even a sculpture piece that caught my eye at Antwerp’s town hall that illustrates this point. To most I’m sure this sculpture looks almost communist to most but to me it’s a matter of being Belgian. Learn the language at CVO’s, go to the Inburgerings Course and be as Belgian as possible in Belgium especially if I want to be known as one! The sculpture sports the motto “ARBEID VRIJHEID” which are the words ” WORK FREEDOM”. 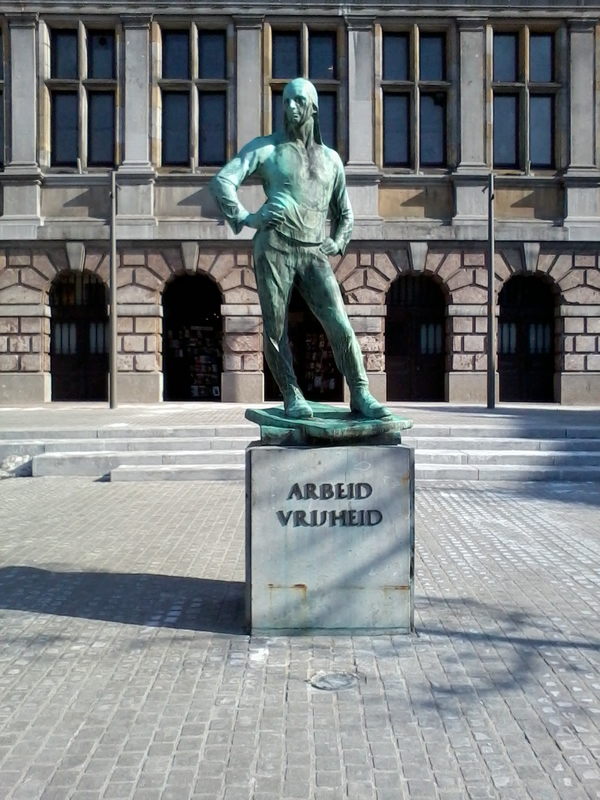 ARBEID VRIJHEID statue at Antwerp Town Hall. To be more Belgian, I need to stop questioning further than my realm of expertise or what I’m expected to do in my work. Perhaps I shall enquire, but with more discretion. I cannot help it – I need to know! I look forward to learning the extra skills I need to be able to work effectively as a Belgian. That means I must become familiar and learn the mathematic skills I need. A tall order for someone who hates mathematics but there’s no other way! When there’s work to do, I need to jump right in and do it. Procrastination is a thing for a non-Belgian. This is another tall order as procrastination is a bad habit of mine. This entry was posted in Belgium, Expat and tagged Antwerp, Belgian, Belgium, Business and Economy, CVO, Google Maps, Hard Workers, Inburgering. Bookmark the permalink. Belgians are Organized – Belgen zijn Georganiseerd.